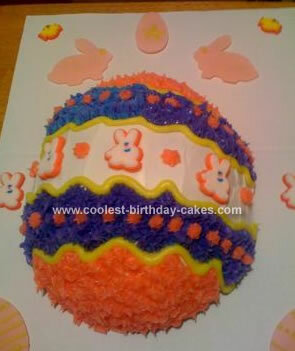 I made this Easter Egg cake for the 1st Annual Adult Easter Egg Hunt held by the bar downstairs from my apartment. I used Wilton’s egg pan that’s been discontinued (got it from eBay) and a French Vanilla Duncan Hines 2-layer cake mix. I put a cookie sheet under the egg pan like someone on this site had recommended and had no problems with the cake coming out lopsided or misshapen. I used a fair amount of Baker’s Joy because I wanted to be sure it came out intact and it did. I frosted it with Wilton’s white frosting and let it chill in the fridge for a 1/2 hour. Then I used Wilton’s frosting tubes in violet, pink and yellow for the piped stars and wavy lines. The candy bunnies were an afterthought but once I put the first one in the middle, he looked lonely so I put some others on there for balance. I rolled out pink fondant and used a bunny cookie cutter and an egg cookie cutter so that the board wouldn’t look so plain. What a cool cake! Did I miss the Egg hunt? ?